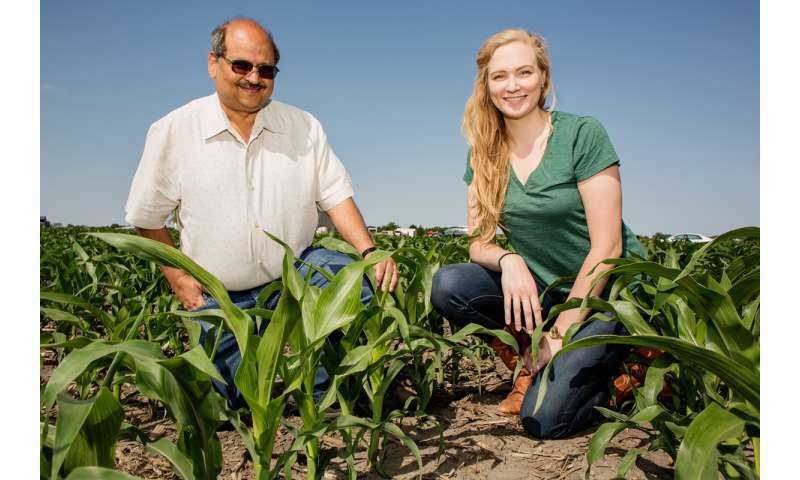 Civil and environmental engineering professor Praveen Kumar and graduate student Meredith Richardson published their findings in the journal Earth's Future. As part of a National Science Foundation project that is studying the environmental impact of agriculture in the U.S., the Illinois group introduced a comprehensive view of the agricultural system, called critical zone services, to analyze crops' impacts on the environment in monetary terms. "The critical zone is the permeable layer of the landscape near the surface that stretches from the top of the vegetation down to the groundwater," Kumar said. "The human energy and resource input involved in agriculture production alters the composition of the critical zone, which we are able to convert into a social cost." To compare the energy efficiency and environmental impacts of corn production and processing for food and for biofuel, the researchers inventoried the resources required for corn production and processing, then determined the economic and environmental impact of using these resources - all defined in terms of energy available and expended, and normalized to cost in U.S. dollars. "There are a lot of abstract concepts to contend with when discussing human-induced effects in the critical zone in agricultural areas," Richardson said. "We want to present it in a way that will show the equivalent dollar value of the human energy expended in agricultural production and how much we gain when corn is used as food versus biofuel." Kumar and Richardson accounted for numerous factors in their analysis, including assessing the energy required to prepare and maintain the landscape for agricultural production for corn and its conversion to biofuel. Then, they quantified the environmental benefits and impacts in terms of critical zone services, representing the effects on the atmosphere, water quality and corn's societal value, both as food and fuel. In monetary terms, their results show that the net social and economic worth of food corn production in the U.S. is $1,492 per hectare, versus a $10 per hectare loss for biofuel corn production. "One of the key factors lies in the soil," Richardson said. The assessment considered both short-term and long-term effects, such as nutrients and carbon storage in the soil. "We found that most of the environmental impacts came from soil nutrient fluxes. Soil's role is often overlooked in this type of assessment, and viewing the landscape as a critical zone forces us to include that," Richardson said. "Using corn as a fuel source seems to be an easy path to renewable energy," said Richard Yuretich, the NSF program director for Critical Zone Observatories. "However, this research shows that the environmental costs are much greater, and the benefits fewer, than using corn for food." More information: "Critical zone services as environmental assessment criteria in intensively managed landscapes" Earth's Future, 2017. However, we have to gt rid of Monsanto, roundup, and GMO. Then corn will be safe to consume and use, again. Until then it's not even fit to be disposed of. Too contaminated with BT toxin, and all the round up does is kill everything it comes in contact with, be it soil, humans, or the corn or other plant life. There are better ways to fix this world than coming into contact with the nasty shadow children of I.G. Farben (the chemical death machine global corporation of Nazi Fame). This is what happens in the AGW Cult when dogma drives their ignorant objectives, it leaves them blind to their astronomical stupidity. Any child economist could have told you that these were the kinds of effects subsidizing corn for biofuel would cause. A great adverse effect of biofuels policy is the effect in 3rd world countries where the inflated cost of corn causes all food prices to rise and marginal lands are then planted and/or fish stocks depleted. This has been seen before and was fully anticipated. But it does feel good for an AGW whatever the costs. The reason it is being used up as fuel rather than being exported as food is simple. Its malthusian. Yet another intended benefit of the AGW construct. In effect it is yet another price-support for farmers. I mean, if we want to make price supports, let's call them what they are instead of engaging in yet another charade in the name of environmentalism. Biofuel should be something that is done with excess biomaterial - anything you cannot use as food - not the primary use. In such a scenario I think biofuels are fine - effectively utilizing something that would otherwise go to waste. The hope is that we'll eventually move to a combustion-less economy where we can reduce land use altogether by eliminating most of the waste. But that is still quite a ways off. Bingo - that is exactly right. And like every other lobby - the farmers will use what ever sounds good - to get rich off crony capitalism. So as a Conservative - right wing Republican - how come it does not bother you that Bush was a major promoter of ethanol. And what about the crony capitalist you have just elected - who just gave the crony capitalist defense industry - the biggest arms deal in history - to the country that supported 9-11, and Trump himself said were bad people - and who are the number one exporter of oil in the world. http://www.zerohe...r-ten-ye I would have thought that if conservatives were truly interested in security - they would be pushing clean/home grown/cheap/abundant renewable energy. We should be making methanol from cornstalk. There's way more cornstalk than there is corn. The existing corn ethanol industry is just an inefficient farm subsidy. The greens like it because it resembles renewable fuel. The right likes it because it doesn't look as socialist as it actually is. Yeah it would be great to plant a bunch of sweet corn and get paid. But what I don't understand is what are you going to do with all of it? Only 1% of the corn grown in the US is sweet corn, and of that a protion of it gets plowed under every year because they can only process so much. And even with all of that considered a can of corn is less than $1. So if we all start growing "food corn" the market will tank. We grow field corn for its other uses; livestock feed, ethanol, PLA, silage, etc. This analysis is pointless because based on this assumption we should just let 90 million acres of land sit idle instead of growing a crop on it because economics wouldn't allow for that many acres of "food corn" to be grown profitably. Its not that simple. For example, from a 200 bushel/acre corn crop the ethanol industry can generate 500 gallons of ethanol, 60 pounds of high protein animal feed, corn oil, and clean CO2 for industrial uses. From that same acre of stalks you can only make 392 gallons of ethanol if you take every scrap of residue off the field. If you want to maintain soil sustainability (which this study was looking at) you really probably only want to take 25-30% of the residue to leave the rest of soil carbon and erosion. From that you can only make about 100 gallons of ethanol. Right now that is whats happening. If we weren't consuming this corn in biofuels it would be rotting in storage. Yields are increasing very quickly while the number of acres planted is remaining stagnant so we have excess corn. China has run into this same problem so now they're trying to chew through their old stocks before they all rot but in the process we can't export any corn to China so we have and even higher excess than usual.